I would like to summarize here T55x7 configurations used to simulate/emulate other 125kHz tag types. Meaning it will transmit 192 raw bits - or 8 bit preamble & 92 manchester de-coded bits. Commercial recievers only output weigand data for the data after the first 1 bit. So instead of the format having up to 44bits (of which 37 can be used in weigand data) it now has 92 (of which i believe 82 bits can be used for weigand data - depending on reader/software capability). the remainder follows the basic format outlined in HID 26-bit scheme above. EDIT 2018: There are a few errors in this image including the last three bits 101 should actually be shifted to the beginning of block 1 and is part of the preamble. also the checksum calculation is incorrect. (normal HID except for the start sentinel). Quadrakey supports the use of different embeddd RFID options including the OmniProx and OmniClass. The OmniProx is basically a HID equivalent FSK technology that uses a 34-bit Honeywell/Northern format. As a result the Block 0 register configuration would be the same as for HID (e.g. 0x00107060). These values create a 34-bit OmniProx card with a facility code = 211  and a card number = 26975. However, if the Quadrakey is using the OmniClass technology (which is basically HID iClass) then you can "NOT" duplicate the card using a T55x7. - 37 bit formats exclude the 1 start bit that preceeds all other weigand data formats. - For > 37 bits however the format is slightly different (see above "HID formats > 37 bits 125kHz"). read here for further information. The credits for the above stuff go to the original authors ! I'm a bit confused here. Are the HID and AWID different 26-bit FSK protocols? Can the T5567 mimic both of them? If so, then how does the T5567 know which protocol to produce. Block 0 looks the same on both of them. I would assume Block 0 is where the protocol is set. I say that because the EM410x Block 0 is different than the others. 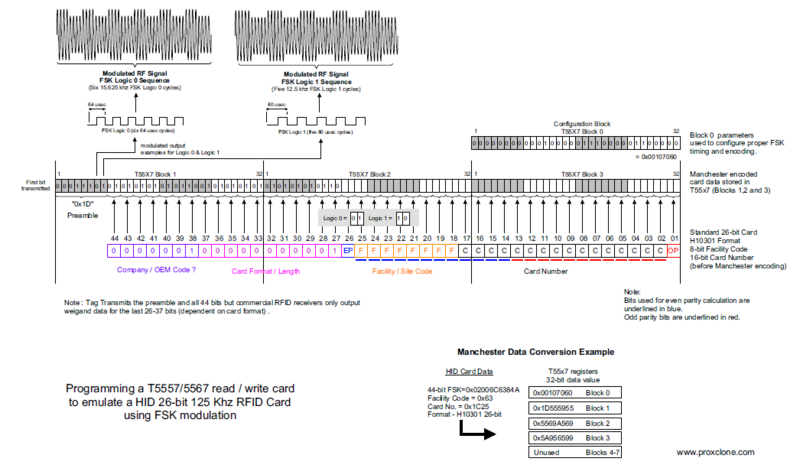 Carl55's pictorial of the HID format below indicates that the card number is stored in Block 3 while the AWID pictorial shows it stored in Block 2. The protocols are the same, as both HID and AWID use the same FSK modulation and transmit 3 blocks of data. The actual data format in binary is different for the two. What would be the best way to close a HID Prox 26 card onto a T5557? But the cloned card cannot be read by any reader (not even on the proxmark with "lf hid fskdemod"). Forget it. Seems to be fixed in the current release. Done. Also added bits explanation from the other thread. Is it possible to make a specific T5557 simulation (bytes to write) for each specific situation or bits decoding in only happens "reader-side" ? 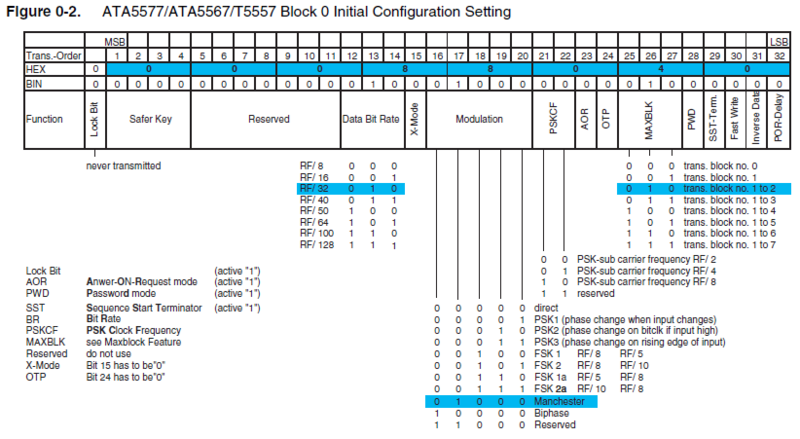 No I would like to know if each kind of bit "interpretation" needs different bytes to be written in T5557 configuration block (pm3 independantly). As far as in know, for HID formats, the transition from <=37 bits to >37 bits is the only change that requires a different configuration block settings. Other formats like EM4100 and Indala require different configuration block settings. Thank you for clarifications. Can you provide Indala configuration (or is it the same of other tags) ? It seems to be missing in the 1st post. And what about HID 35bit format ? also note that the above image for EM410X formats has a typo for block 0. HID 35bit follows the standard HID configuration settings (just like 26 bit), just a different data format for blocks 1-3 as outlined above. So em410x is the same as indala ? (Thank you for pointing out the error, i will elaborate the pic to correct it asap). Can you make a practical example (all t5557 blocks) for a hid 35 bits? as far as hid 35 bit, if I get some free time I'll try and put something together. Error in EM410x picture corrected. Can you also make an example (all t5557 blocks) for Indala ? I am sorry to ask those stupid questions but I am really "weak" in 125kHz filed (no tags to test) and I want to collect the greatest amount of information possible. EDIT: thank you for your time ! the heading HID 37 bit HUGE / H10302 is missing the data that went with it. My fault. Corrected right now (from my mobile phone, I hope all is ok). You mean in general or in the 1st post of this thread ? In the first post of this thread indala looks wrong. I like the link tho. The 26 bit indala SC, CN, E, and O AFAIK should be identical to 26 bit HID. How those bits are arranged on the card memory is different and is explained in the link. Thank you very much ! It works GREAT ! Hid 35 bits have the same block0 as hid 26 bits, right ? While hid 37 is slight different [001070C0], correct ? A silly question: in "bit explanation (vaious tags)" bit0 is NEVER considered... is it present or the explanation consider the 1st bit as bit1 insted of bit0 ? I'm not sure where you are referring to, I typically start counting at one for ease and to count the bits (tho sometimes I start with 0 to match a reader SDK or something). If you are referring to the chips memory then there is a locking bit to every block that sometimes is referred to bit 0 but it is only used when programming and it is never sent by the chip. Has HID 37 a "bit0" or bit0 of the above example correspond to bit1 ? This is important in decoding/descrambling bits because we must know the correct bits label to define a decoding profile. See the legend for what sc,cn,e,o means: there is not a bit0 mentioned in the format you quoted. Hi sentinel, can you explain what you mean with "recording" ? Marshmellow I sent you a message on ICQ. I would like to know if hid cards has 44 and 84 HEX ID values or there are others (I think that 48 and 88 is the real size, maybe 4 leading 0 ?). I just recently got a T5557 compatible card and i wonder how to extract the data. I want to read the blocks as they are. Can someone hint me how to interpret these first 5 bits in line 0? And why do i get the inverse? I dont see the settings for such behaviour in the data sheet. It appears the mandemod command is interpreting the end of a looping transmission as an error and it inverts the interpretation. do you know that the chip is configured for Manchester? Also I think with the readblock function you need to use data bitsamples or data hexsamples and not mandemod. but i'm going off memory..
fourth bit periods, modulation is switched off (using Manchester encoding, switched on). ST can be switched on/off (active1) in bit 29 on block 0.
there are other threads that have mentioned some issues with mandemod and timings, I believe there was a work around being done to manually set the timings, though I believe it is buggy for now. I'll see if I can remember where I saw that and post a link. You mean to manually set the clock i think. Thats not the problem though, mandemod function isnt made for mandemodding just a part of the samples and skipping those that do not fit. Small errors in captures are overcome with allowing some tolerance - probably the only reason i get an output here. If it would go strictly after manchester rules it would throw an error on any of those TS and stop. Ill write some code for better handling of these cool T55x7 cards sometime, but for now ill go with manual demod. Makes more sense, sorry, I've been distracted. I would like it if the mandemod function would warn you that it hit errors in the stream and "tolerated" them, because I think it often tolerates them and outputs something completely wrong, as in this case. something to look at I guess. for block reading a T55xx I usually just use a GIS TS-38 reader, so I haven't experimented too much with the proxmark readblock function. Ill work on it soon. Ill decrease tolerance and allow to skip samples that are not modulated. We ll see how tjat works out. I have ideas for even more sophisticated demod options (like regex just for mixed modulation waves) but ill have to test some stuff for that. can a moderator make this thread sticky? it is a good reference tool for most new comers, and it would help if they didn't have to dig so far to find it. Given some docs from Asper, I implemented some more descramble patterns in em410x decode. It was just pointed out that the image for 35 bit prox has an error. The block numbers are backwards. They should be numbered from the left to right 1 to 3 not 3 to 1. Also it appears the data about quadrakey is incorrect (or different versions of it exist) per the recent nexkey/nexwatch posts, quadrakey is actually a PSK modulated 32 bit ID with nexwatch formatting. but it's kind of changed to some other value with top turn on. I would also be interested to know if the proxmark can lock t55x7 cards after writing to them. I have a Chinese reader/writer device that can lock cards which I use when I need to lock them but it would be good if this could be done on the proxmark3 ? To password protect it is just a matter of writing your pwd to blk 7 and writing the correct config block for your tag with pwd mode on. Locking is different and makes the tag permanently read only. Yes I was hoping to lock the tag with the proxmark to make it read only as this can be done using chinese reader/writers. From your post I assume I could add a pwd to stop people writing to the tag but it would be easier if there was a simple command to lock the card? Most ppl prefer the password option as that leaves the possibility that at least you can change the programming if needed later. However, it should be as simple as adding a parameter for the locking bit to the write command. So if you'd like it, add it. . Permanently locking a tag is not very useful in RFID testing and research, which is the intended function of the pm3. It is NOT a cloner. And if someone asks you to clone it for them, then they will not know either wheater its pwd or lock protected. Theuy just want a clone and don't know the stuff behind it. BTW, original tags from real mfgs aren't locked but password protected instead.